Life at a small charity is a constant roller coaster ride of emotions. The highs can be a rush of adrenaline; the lows absolutely demoralising. The first half of this year, following an incredible end to 2016, was extremely challenging. A drastic drop in income levels and soaring costs in Kenya, particularly of food, have been the cause of many a headache and sleepless night. But, as we always somehow do, it looks like we've ridden out this latest storm. Read on to catch up on some of the exciting things that we've been working on over the last few weeks and that are in the pipeline for the rest of the year and beyond. We have been able to maintain our school meal programme even in the face of rising costs for the last year. However, although food prices have finally stopped rising, we have had to take the difficult decision to reduce the size of meals in order that we can live within our limited means. The recent rainy season has failed to alleviate the drought and food is likely to remain scarce for the foreseeable future, so our lunch programme continues to be a vital lifeline for the 2,750+ children that it benefits. "The food African Promise supplies for our school is the only refuge that saves the life of the most vulnerable children in this part of the earth." 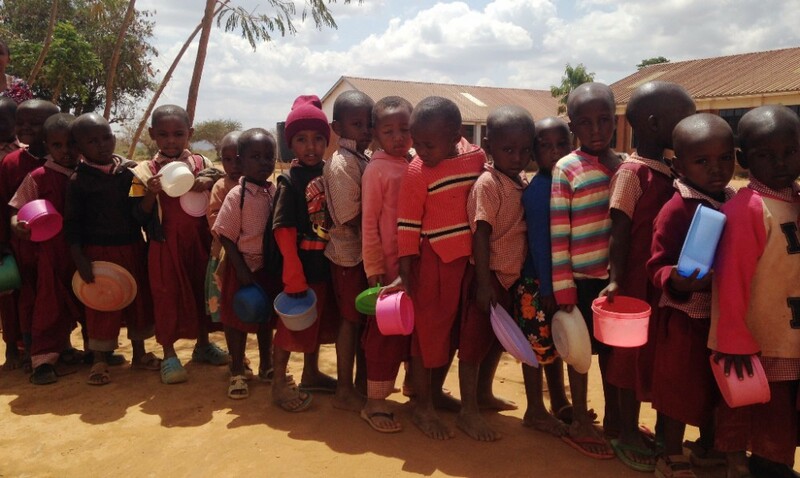 Nursery pupils at Kisimenyi Primary waiting to be served lunch. We have just started work on a dining hall so that they no longer have to queue for, or eat, their lunch outside under the hot sun. The paint may barely be dry on the redevelopment of our seventh partner school at Ngambenyi but we are already getting itchy feet to do it all over again! 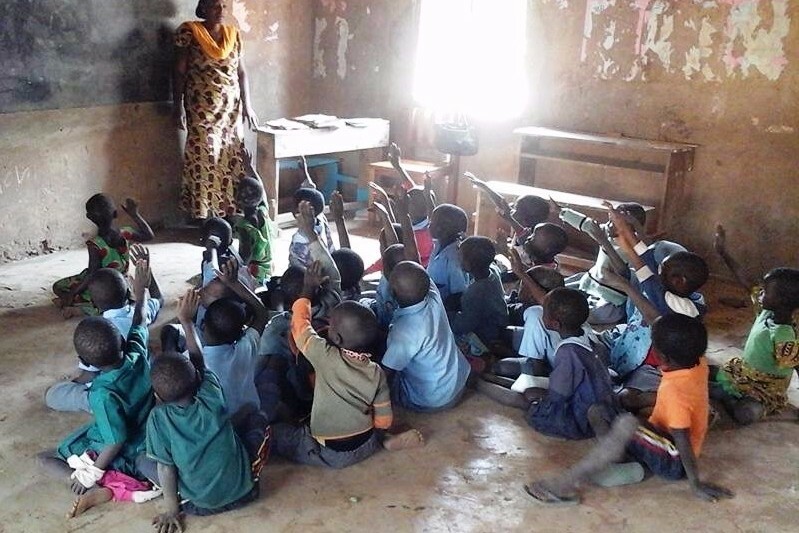 We have earmarked Mkamenyi Primary as our next partner school, in part because our good friend Nicholus (who has previously been head of two of our current partner schools) was recently appointed as head teacher. Large parts of the school are in a woeful state and its 500+ pupils are in desperate need of our expertise. 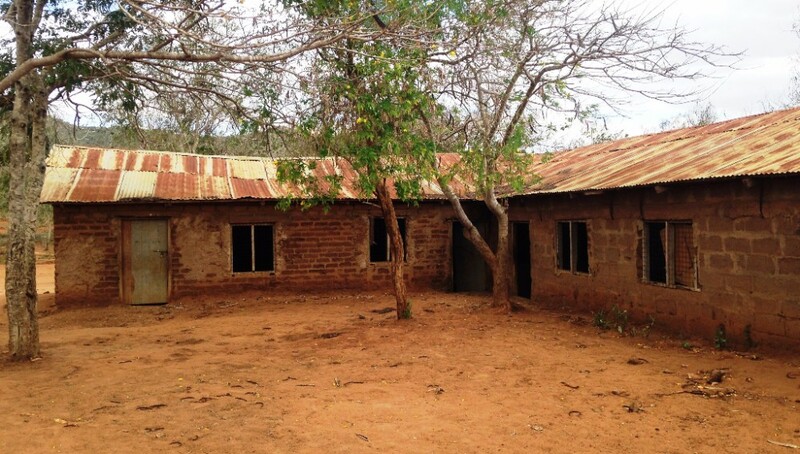 We will be visiting the school with our engineer in the coming days to start formulating a plan for a complete overhaul of the school and expect to launch a major fundraising appeal early in 2018. To celebrate their recent engagement and forthcoming nuptials, our founder's sister Katharine and her fiancé, Mark, have decided to run a three-legged half marathon to raise funds for our work. Yes, that's right, they will be taking on the 13.1mile Royal Parks Half Marathon course whilst joined at the ankle!! Although they are both regular(ish) runners, I think we can agree that this is an extreme challenge - the longest they have so far run as a three-legged pair is *just* 3 miles! To make the challenge worthwhile, Kat and Dickie (as they are known), are aiming to raise an incredible £10,000. "We have been training separately over the last few months and finally did our first three-legged run recently in New York. We received some strange looks (which surprised us somewhat given the bizarre sights you often see in New York!) but we managed to complete the session without falling over and without falling out! A great success!" We are delighted to have been shortlisted by our long-time supporter Aspect Capital to be their 'Charity of the Year'. The company's staff will vote next month for which charity they want to benefit from their fundraising week, which usually raises around £40,000. 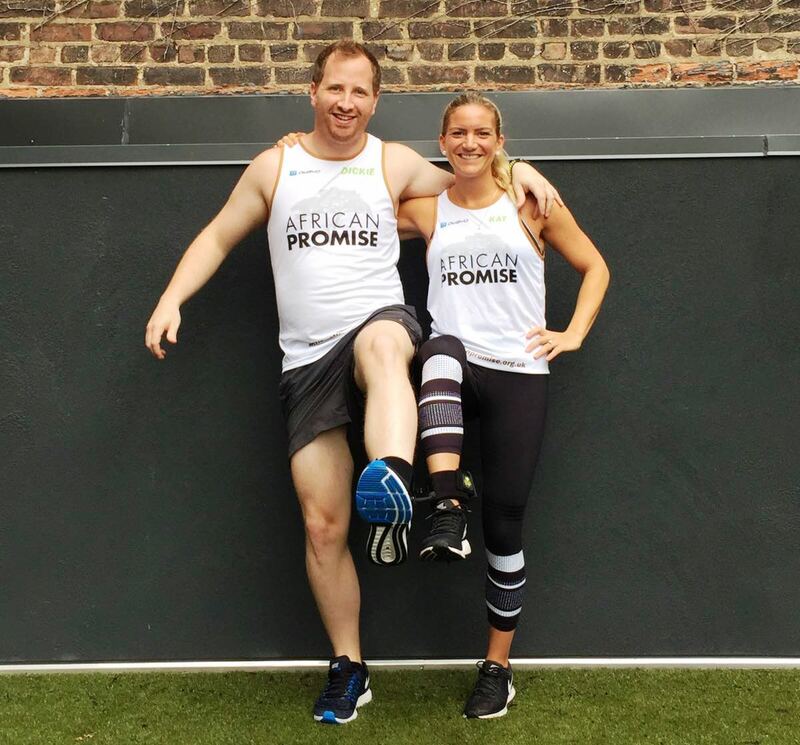 - Alex Collins and her husband Ian, who asked guests at their recent wedding to donate to African Promise. Alex volunteered in Kasigau around the same time as our Director. - Our ambassador, Suzanne Payne, and new friend, Alys Penfold, who braved wind and rain to sell baskets and crafts at the Binsted village fete. Alys has a remarkable 'small world' story of a basket, a weaver 4000 miles away and a load of incredible coincidences that you can read here. 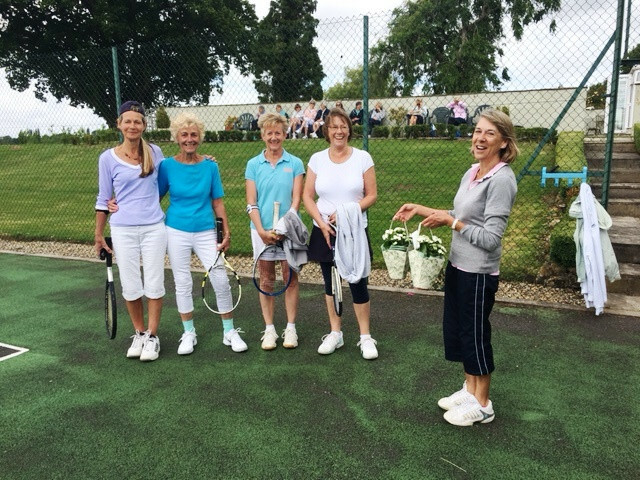 Sue hands out prizes to finalists at her tennis tournament, and our ambassador Suzanne with new friend Alys. For a long time we have needed better visuals to help bring to life the work we do in our partner schools. Given the nature of our work, it is true that a photo is worth a thousand words. A film is worth even more. 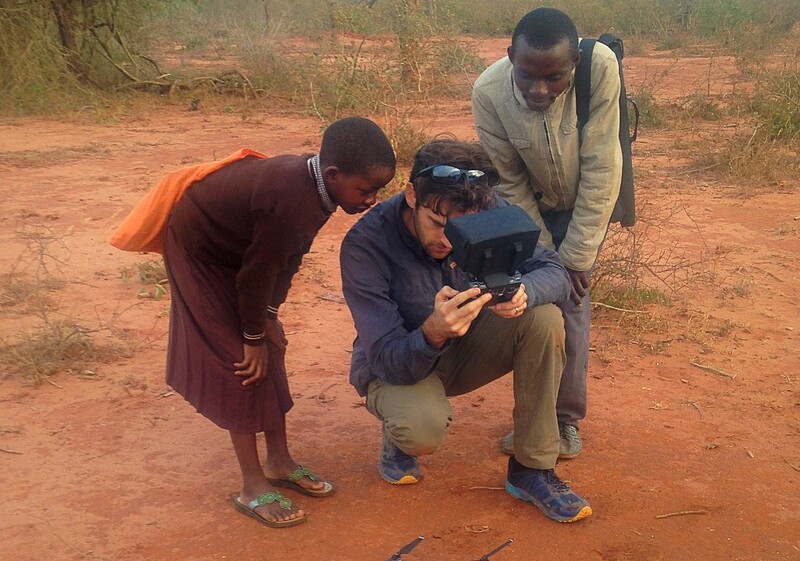 Last month we were joined in Kasigau for a few days by filmmaker Ben Sherlock from Xplore Films. We had an exciting (if somewhat tiring) few days shooting - including with a drone - in two of our current partner school plus our proposed eighth. Ben is now busy editing the photos (one of which is featured at the very top of this newsletter), as well as some short films which we look forward to sharing with you later in the year. 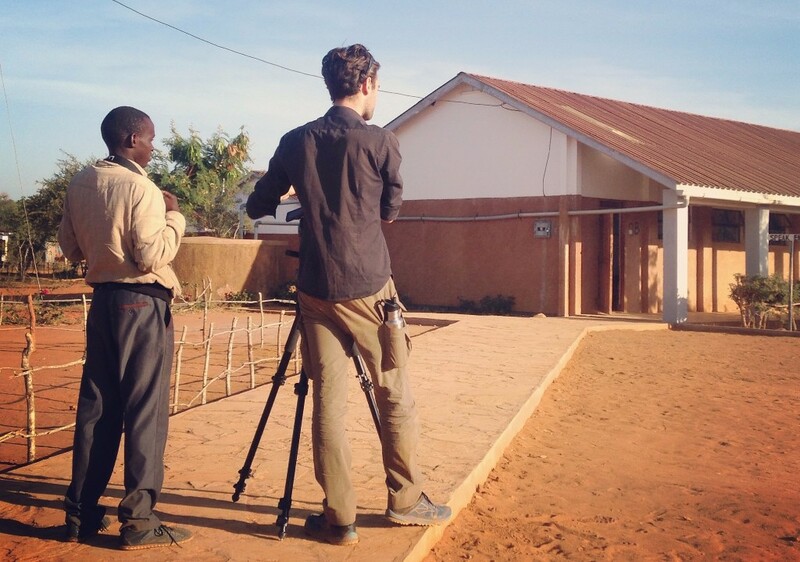 Ben is pictured above with Steven, a graduate from the local secondary school, who we offered the opportunity to assist on the shoot and Rose, a pupil from Ngambenyi Primary, who is the star of the opening sequence of our film! We are thrilled to announce the appointment of Carrie Hall Schalter as an ambassador, our second such appointment following that of Suzanne Payne in 2015. 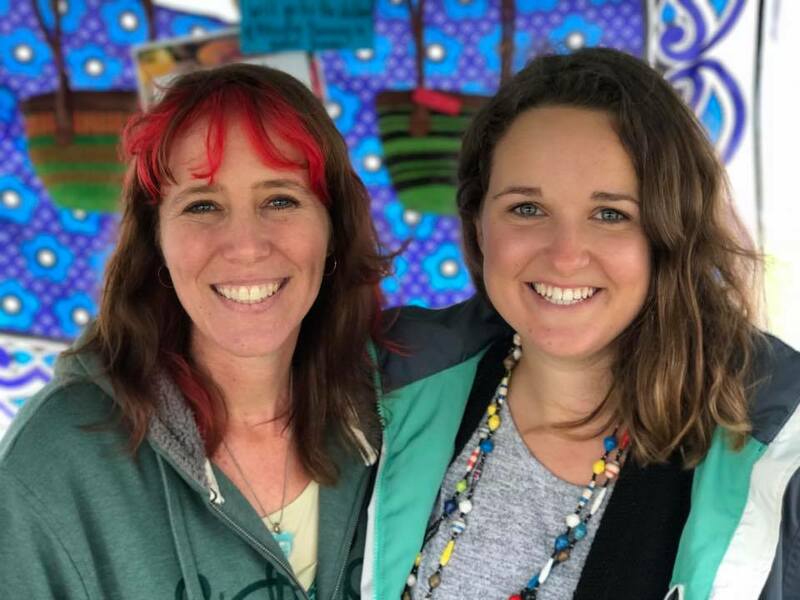 Carrie, who lives in Detroit, USA, has been a dear friend of African Promise and the wider Kasigau community for a number of years and this appointment is recognition of those years of service and the promise of many more to come. Carrie is pictured with her husband, John, and pupils at Kiteghe Primary School during her 'Cameras for Compassion' workshop at the school in 2013. 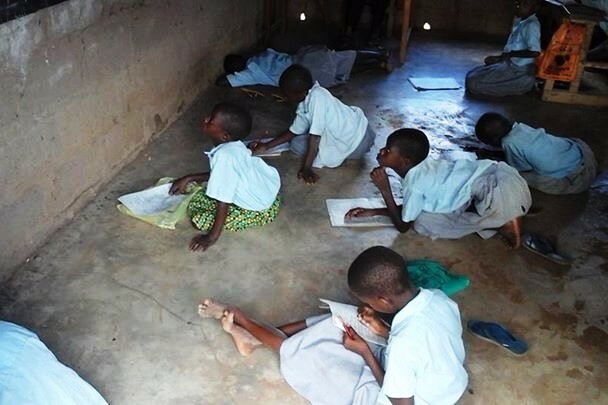 African Promise is a small charity working to improve the quality and provision of primary education in rural Kenya by ensuring schools are equipped to deliver an education worth having.